Raleigh SCX 2015 Series Winners receive their prizes. Scottish riders Davie Lines and Lucy Grant received their prizes as overall winners of the Raleigh SCX 2015 Series. 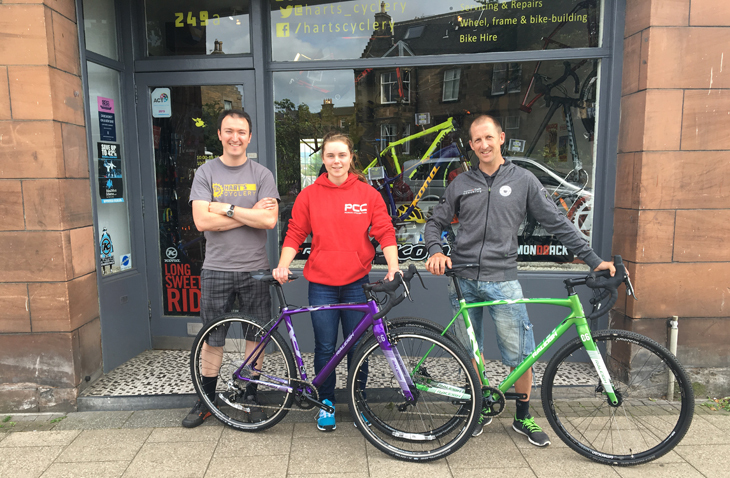 The Raleigh RX Race and RWX Race bikes, supplied as part of Raleigh’s two year sponsorship of the Scottish Cyclocross Association, were built up and presented by Graeme Hart at Raleigh’s Edinburgh dealer, Hart’s Cyclery. The Series winners also received CX wheelsets from Strada Wheels. “A massive thanks to Raleigh and Strada wheels for their support and prizes for winning the Scottish cyclocross series. To be presented with prizes like that makes all the training and rolling around in the mud completely worth it!” said Davie Lines, at the presentation on Monday. Both Davie and winner of the closely-fought Womens series, Lucy Grant (Peebles CC), will get the chance to start the defence of their titles at the 2016 Raleigh SCX Series. This years seven-race Series kicks off with the traditional opener at Raleigh SCX 1 - Callendar Park on Sunday, October 9, 2016. The upcoming calendar promises a lot of exciting developments, with a number of youngsters moving up into more senior categories, new teams and rider transfers, and the groundswell of enthusiasm for CX all contributing to what will hopefully be another great season for Scottish cyclocross.